Step aside, Jetsons. A functional “flying car,” built more for traveling over water instead of roads, has come to life. This cool invention is called the Kitty Hawk Flyer, an aircraft prototype that can double as a boat and is backed by Google founder Larry Page, The New York Times reports. In their website, the Kitty Hawk Flyer is described as an all-electric aircraft that is safe and legal to use in uncongested areas of the United States under FAA regulations. “Our mission is to make the dream of personal flight a reality. We believe when everyone has access to personal flight, a new, limitless world of opportunity will open up to them,” a company statement read. The prototype, which can only accommodate one person, apparently weighs 220 pounds and lifts off with the help of eight battery-powered propellers. 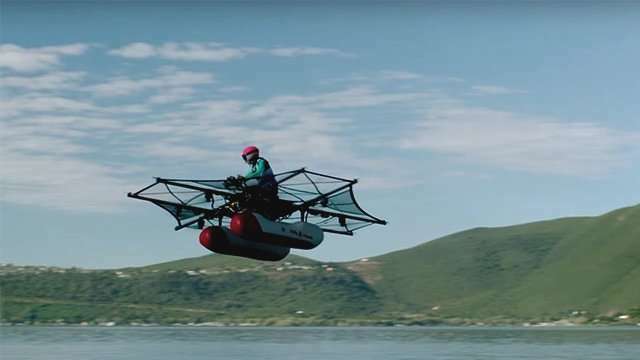 A five-minute demo of the aircraft shows it floating around 15-feet above a lake, piloted by a man who appears to be riding what looks like a flying motorcycle. The Kitty Hawk Flyer is expected to be available for purchase by the end of 2017. Its price point has yet to be announced, but for a $100, you can sign up for a ride on the prototype while also getting a $2000 discount when it's actually released to the public.